GCRMC is a non-profit 501 (c) 3 organization. Proceeds come predominantly from our Annual Show but Contributions are accepted. Our benefactors include the Ronald McDonald House™ and the Hadji Shriners Childrens Transportation Fund. Over the past 35 years we have donated over $550,000 to these organizations. Check out our Donations page for the last donation ceremonies. Our organization consists of more than 100 active members and enthusiasts from around the Gulf Coast area. We participate in local events, regional festivals, parades, road trips (sightseeing, historical, and general interest), local and national Mustang shows, picnics, parties, and various other group activities. If you are interested in joining, have a question about our club or just want to find out something about your Mustang, you can contact us at info@gulfcoastmustangclub.org. Feel free to attend a few meetings and see what GCRMC is all about. When you are ready to join, you can complete a Membership Form and pay your dues on-line, or download and complete the membership form and mail in with your check or bring to the next meeting. You can find our Meeting Schedule and plan on comming. We meet the 2nd Thursday of each month. Dinner is at at 6 PM and the meeting runs from 7 - 8:30 PM. Please feel free to come to a Meeting and learn more about GCRMC. Check out our Upcoming Events and join us at a show or drive. Even if you don't have a Mustang, you can have fun and benefit a couple of great causes. Our 40th Annual Gulf Coast Regional Mustang and All Ford Mega Show is coming March 29 - 31, 2019. We will also be having an Arts & Crafts Show on Saturday, March 30th. General admission to all events is free. To enter your car on you Register on-line. Alternatively, you can download the Registration Form, complete, and mail in with your check. For information about Vendors (food, auto, arts/crafts, etc.) click Here. Vendors can Register on-line also. 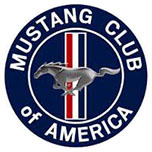 The Gulf Coast Regional Mustang Club is a regional chapter of The Mustang Club of America (MCA). GCRMC has been enjoying the Mustang car in Northwest Florida since 1979. If you like Mustangs, you will like the Gulf Coast Regional Mustang Club. Come to a Meeting and get to know the great Mustangs of this area and their owners too. Have fun and realize that you efforts will benefit The Ronald McDonald House™ and the Shriner's Hospital for Children®.